Take a look at how to log your pet with PetScanner and explore the additional benefits of the app. As well as being an official pet database, PetScanner offers many other features that you and your furry friend can enjoy! Take a look at how to log your pet with PetScanner and explore the additional benefits of the app. Download the PetScanner app, register for free and get yourself a PetScanner microchip reader. Connect the PetScanner microchip reader to your phone and scan your pet’s microchip - subscribe to create a pet profile. Scan and connect with other users to instantly find your lost pet and reunite other pets with their owners. Enjoy additional features of the app such as finding your nearest dog-friendly place and receive updates on local lost pets. Want to use the PetScanner app for free? Paired with our scanner, the PetScanner app is free to use if you just want to scan and identify a microchipped pet. Furthermore, when a non-subscribed pet's chip is scanned with PetScanner, we'll give you the microchip number and the UK DEFRA database the pet is registered with. In addition to this, the phone number of the registered database will also be provided so you can call them straight away. 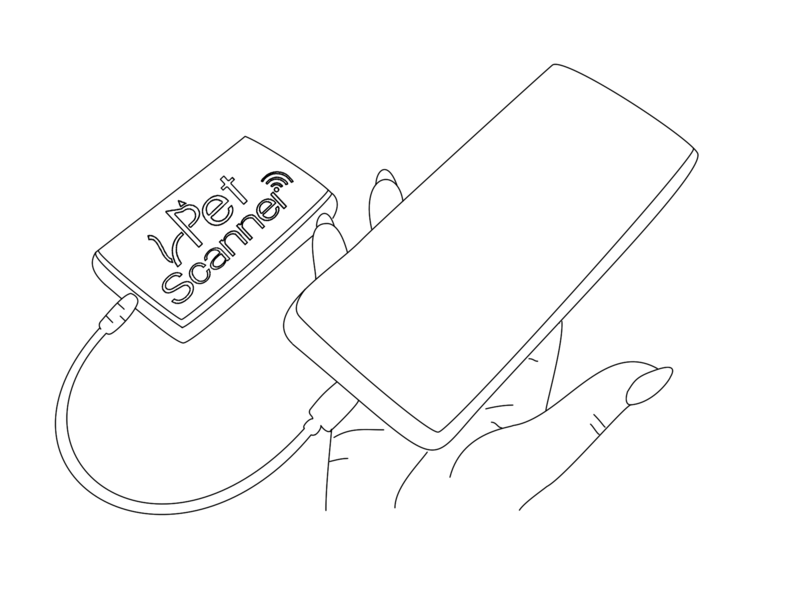 If a subscribed pet's chip is scanned with PetScanner, you will be able to call, text or email the owner straight away. 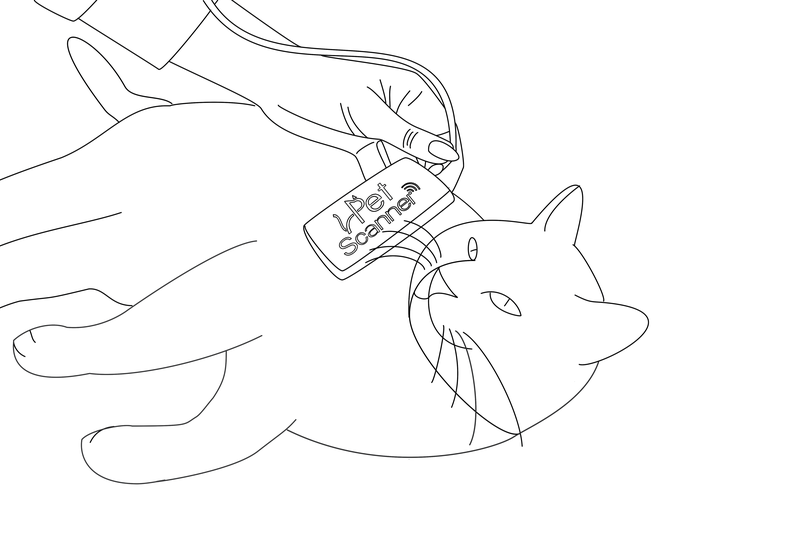 As a result, the pet owner will also get your name, phone number, and the GPS position of where the scan was made. If in the instance your pet is lost, stolen or in an accident, the person who finds your pet can use a PetScanner to scan your pet’s microchip, you will then instantly get a notification on your phone of your pet’s whereabouts and the contact details of the person who is with your companion. On the other hand, if you find a lost or stolen pet, you can scan his/her microchip and the PetScanner app will display the contact details of the pet’s owner on your smartphone, whilst pinging over a notification to the owner which displays your contact details and location. 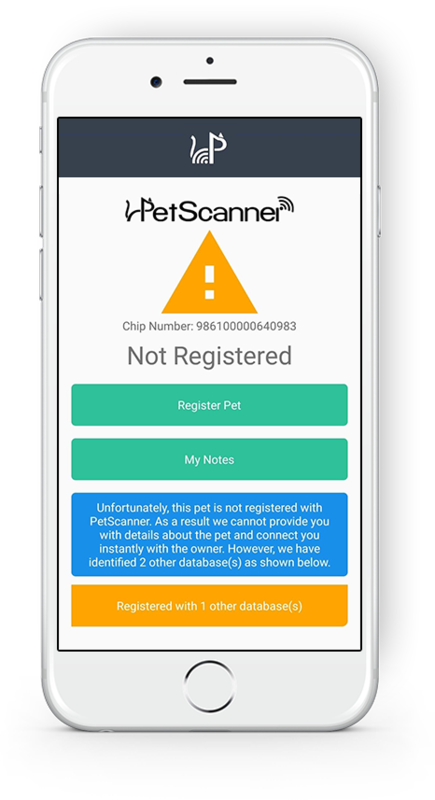 PetScanner ensures that pets can only change ownership when the true owner has authorised the transfer by unlocking their pet in the app. If there is any attempt to transfer ownership of a locked PetScanner registered pet, it will fail, and you as the rightful pet owner will instantly receive a notification of who is scanning your pet and where they are located.